Mine is BLES01928 Version 01.01 App Version 01.00. If 2710, you'll get 100 Praxis from your first takedown which will be more than enough to buy everything. Perfect for duplicating things, turn off when finished. 1st line is for takedowns. 2nd line is for anything else. Do no use this at the same time with Health Never Decreases, they are the same addresses and risk crashing. This also prevents your health from decreasing so you do not need both. This uses a function to dump my base offset instead of a static pointer route to my health. Do not use at the same time as Invincibility, they use the same addresses and risk causing a crash, and Invincibility prevents your health from decreasing so you do not need both at the same time. Instead of having a function dump my base health offset to address 01EF1000, this uses a static pointer route. Enemies never see you but they will investigate sounds you make after you return them to normal. If you touch them while they are frozen, they will be alert the instant you unfreeze them. Fixed it so it doesn't mess with doors and other things now, should just affect NPCs and enemies. Required for freezing enemies and flying by jumping. Last edited by bungholio; 03-26-2016, 10:36 AM. I've updated it and re-written some things. Added battery never decreases, credits gained multiplier, experience gained multiplier, inventory items never decrease, inventory item duplicator code, freeze enemies, invincibility and health never decreases that uses a hopefully permanent static pointer route. I'm still playing. While I'm messing with this game, any requests? Now would be the perfect time. Last edited by bungholio; 03-24-2016, 08:57 AM. 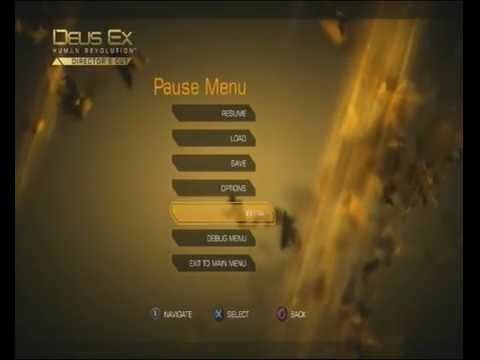 Deus Ex Human Revolution NPEB01805 Version 01.01 App Version 01.00. If you set to 2710, you will get more Praxis points than needed to purchase every upgrade from doing anything. Very specifically, when you reduce items by using or dropping them, if the item count is 1 and then decreases this line runs to completely remove it from your inventory. This prevents the complete removal but does not prevent it from decreasing to 0 so use Inventory Items + Total Ammo + Hacking Tools Never Decrease to fix that. This can be used to duplicate items, once you drop an item and then re-enter inventory the item will be back in your inventory and on the ground at the same time. Never use Health Never Decreases and Invincibility at the same time, they use the same addresses and risk crashing. If you touch them they will be alert the instant you unfreeze them. Needs to be turned on for freezing enemies and flying by jumping to work. These are for the normal non-Director's Cut of Deus Ex Human Revolution BLUS39476 Version 01.00 App Version 01.00. Last edited by dron_3; 06-28-2016, 07:16 AM.